MIT’s motto is Mens et Manus, or “mind and hand” in Latin. Mark Orrow-Whiting shares his insight on why the “mind and hand” philosophy is integral to our school’s approach to STEAM learning in collaboration with MIT. This month the Massachusetts Institute of Technology (MIT) has been recognised as the World’s Leading University – for the 7 th year in a row! How do they do it? One of the secrets of their success, I think, is hidden in MIT’s motto – Mens et Manus. Most universities and schools have a motto – ours is Be Ambitious – the difference is what they do with them. Like MIT, we believe that a motto should be so much more than a platitude. It should be something that we live, every day. And if you visit MIT, you’ll see Mens et Manus in action in every part of the university. But what does it mean? Mens et Manus is Latin for the simple phrase “mind and hand.” This is MIT’s way of saying that it is only through the combination of thought and practical action that we will be able to solve current and future problems. It is only through the application (hand) of theory (mind) that we will be able to make real change and make a real difference. And this is why Nord Anglia Education found MIT so fascinating, and why we took the time to create such a unique collaboration with the leader in STEAM subjects (science, technology, engineering, arts and maths). 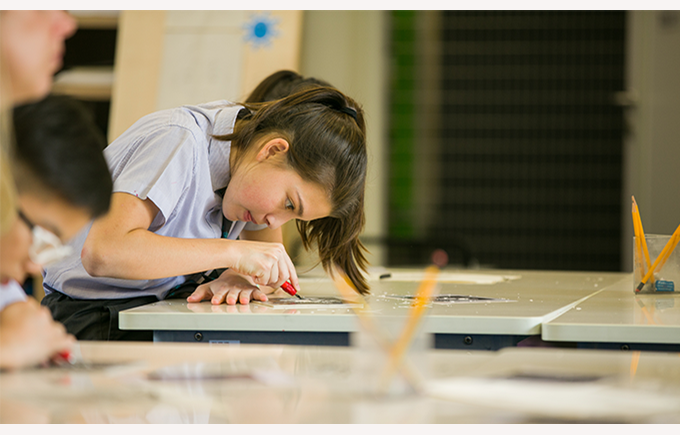 At Nord Anglia, we believe that knowledge is important. However, unlike many educationalists who think that the pursuit of knowledge is the sole purpose of education, we also believe that students need to develop the skills that are going to help them be successful in a changing world where new problems continually arise and jobs have not yet been created. In other words, Mens et Manus is a state of mind that we try to imbue in our students—how to think of an idea, and then go forth and execute it. Through the hands-on application of concepts, students are able to develop skills such as resilience, creativity, innovation, flexibility and collaboration. These and other skills must go alongside the acquisition of knowledge, also known as the development of the mind. It is these two complementary actions, which ultimately form part of a well-rounded education. The Mens et Manus philosophy is particularly important in teaching the disciplines of STEAM. Real world problems, whether it is climate change or water scarcity, do not solely exist in individual subjects. They require a dynamic range of disciplines to work together to solve these issues. By using the Mens et Manus philosophy with STEAM education, we are not only giving students knowledge, but also the confidence to implement their ideas, experiment, innovate, and ultimately develop practical and workable solutions. MIT have been working with us for a year now and already we are seeing the impact of their approach in our schools. Students who come to MIT for the annual Nord Anglia-MIT STEAM festival are more engaged and inspired, teachers who come to MIT for professional development are able to take their new ideas back in to the classroom and the termly MIT challenges for all our students are a great way to see the “mind and hand” philosophy come to life in a real and tangible way. What is particularly inspiring about MIT, and what we aspire to emulate, is this – MIT have found ways to combine the mind with the hand in every classroom, lecture theatre, workshop and building on campus. Every student who graduates from MIT understands the importance of practical approaches to problem solving. It is also presumably why MIT is once again the world’s leading university. It is this approach that will help all of the students graduating from a Nord Anglia school to go on to be successful in the 21 st century.